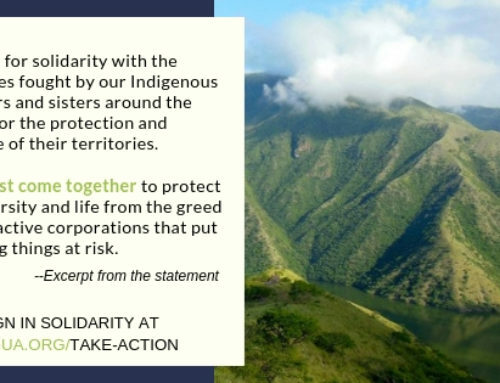 Thanks to those of you who’ve responded to my recent call for action in solidarity with political prisoners in Huehuetenango and for financial support in NISGUA’s successful May Match campaign! 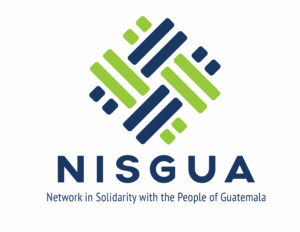 Those of you who’ve signed in support of the release of Saúl Méndez and Rogelio Velasquez will have your voices heard in the coming weeks as NISGUA’s partners in Madrid coordinate the presentation of the petition to Guatemalan embassies in North American and Europe. 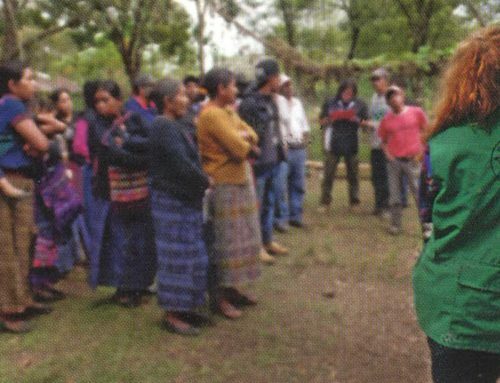 It has been a while since I’ve reached out to you all with more substantive updates and reflections on my work as a human rights accompanier in Guatemala, but I’ve been thinking of you. Firstly, with the (bittersweet) excitement of knowing that I’ll be seeing many of you soon as I conclude my six-month contract this week and start to make my way back north. And secondly, with curiosity and hope in the histories converging in the current moment in both the U.S. and Guatemala that have provoked diverse forms of protest and commentary in response to the specific violences of institutionalized racism and corruption. Throughout the unfolding of what many are calling a “black spring” in the United States, I have been doing my best to stay well-informed and vocal from afar, but have learned that while social media helps me keep my anger current, it also affirms distance and lends itself to feelings of powerlessness. For this reason, I am especially looking forward to opportunities for shared, in-real-life reflection (and action) with those of you who’ve been directly engaging (as listeners, as actors) in the #BlackLivesMatter movement. Even from where I stand in Guatemala, it is clear that the questions we need to ask ourselves are difficult, the answers complex, and the stakes as high as they have always been. Right now in Guatemala, the same is true. This spring, in the largest wave of popular protests since the signing of the Peace Accords in 1996, the population has demanded the resignation of public figures (including the president) believed to be linked to the crime syndicate “La Linea,” which compromised customs revenue by waiving import tariffs in exchange for bribes. The protests (connected by their shared usage of #RenunciaYa or #StepDownAlready) have led to the resignation of the vice-president last month (which analysts have also linked to the influence of the U.S. embassy and American economic interests) and have energized similar investigations aimed at undermining impunity. In a country where an indigenous majority experiences some of the deepest poverty in the region and where the current regime frequently cites a deficit for the deplorable conditions of its education and health systems, it is not surprising that the abuse of public funds has been met with unrest. #BlackLivesMatter and #RenunicaYa have emerged from distinct contexts and reflect varied objectives, but they have something important in common: a dawning recognition that the creation of a just present requires deep and critical engagement with the past. Beyond expressing just rage in response to specific instances of extreme police violence, #BlackLivesMatter protests address the pervasive reality of institutionalized anti-black racism as a direct legacy of African slavery in North America. Similarly, the diverse perspectives represented in #RenunciaYa question the meaning of democracy and peace since the signing of the Peace Accords and reflect a shared acknowledgement that today, as they have long been, terror and impunity are the rule in Guatemala, while justice is the illusive exception. So, what does all of this have to do with human rights accompaniment? While the theft of public funds by La Linea may seem petty in comparison to the genocidal violence exercised by the state against poor and indigenous Guatemalans for decades (and centuries), the scandal is emblematic of the institutional precarity that permits human rights abuses to thrive in Guatemala. Weak courts, racist police, and highly corruptible public officials are easily utilized by transnational companies to repress movements that challenge their extractive, exploitative logic. In the midst of #RenunciaYa’s unfolding, three more leaders of the resistance to hydroelectric development in Huehuetenango have been incarcerated, and over a dozen more have had warrants issued for their arrest. The most recent arrests bring the total number of political prisoners in the north of Huehuetenango to 9, with every organization that I’ve accompanied experiencing the threat of the incarceration of its leaders. While criminalization has intensified in my time as an accompanier (six new prisoners in six months), it is not a new phenomenon in Huehuetenango. In May 2012, five years after the people of Santa Cruz Barillas had unanimously refused the presence of extractive mega-projects in their territory in a consulta comunitaria, an activist who had vocally opposed the installation of two hydroelectric dams on the Cambalam River was murdered by the company’s private security. In the days following his murder, anticipating impunity, the people of Barillas rose up to demand justice for his death. The state responded with a state of siege, militarizing the city and its outlying villages, suspending civil liberties, and making massive arrests alleging destruction of company property and threats to its employees. For survivors of the internal armed conflict, the presence of the military was traumatizing; many took refuge in the forest, convinced that the war had started again, and some still suffer effects of post-traumatic stress. While military intervention in Barillas sought to terrorize a public in unrest, the justice system has sent clear messages about its take on the value of rural Guatemalan life and transnational private property. The employees of Hidro Santa Cruz who murdered Andrés Francisco Miguel have yet to be successfully sentenced three years after his death, while community leaders have spent months and years in pretrial detention accusations based on their leadership, and not in their proved participation in criminal activity. Often, it has taken years to close their cases even after they have been released for lack of proof or faulty investigations. In my last update, I introduced criminalization as a strategy for repressing and neutralizing social movements. In simple terms, criminalization literally makes activist leadership a crime. In the cases I’ve witnessed in my time as an accompanier, leaders have been charged as the intellectual authors of spontaneous protests that have demanded justice and accountability for state sanctioned violence. But many have actually played mediating roles in conflictive situations, attempting to minimize the risks that protesters take in expressing their desire for justice while maximizing the possibilities for dialogue. But the character of their participation is not of interest to prosecutors; their mere presence has made them the subject of criminal investigations. In some cases, being present isn’t even requisite for being charged. The repressive impact of incarcerating leaders is made more effective by the issuing of arrest warrants against entire organizations and communities. While an arrest warrant does not guarantee an arrest, the threat of arrest may be even more debilitating to the capacity of movements to demand justice. The most recent arrests have been made in the capital, where leaders have traveled between 8 and 13 hours to attend hearings for their peers or file police reports against violent public officials. An arrest in the capital, as opposed to in rural Huehuetenago, sends a strong message: Leaving home means increasing risk of arrest, and the police knows when you leave home. What’s more, these arrests have been highly public and visible to movements based in other regions, where the impact of criminalization is felt as well. Where I work in Huehuetenango, the impacts are palpable: Those with warrants live in fear of arrest and must navigate the need to limit their movement and participation as movement becomes more necessary than ever. The families of those incarcerated adapt to long, frequent, and expensive trips to capital cities to visit their loved ones, while living the consequences of a lost income, all while movements require their collaboration to build broad support for political prisoners. 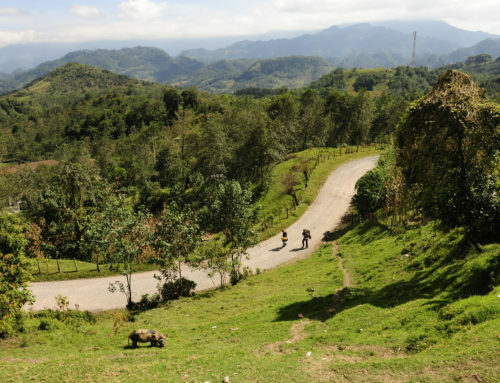 For indigenous campesinos especially, navigating legal spaces and processes is an uphill battle, and language barriers and ethnic discrimination often mean total exclusion. On the periphery, some still talk about seeking refuge. 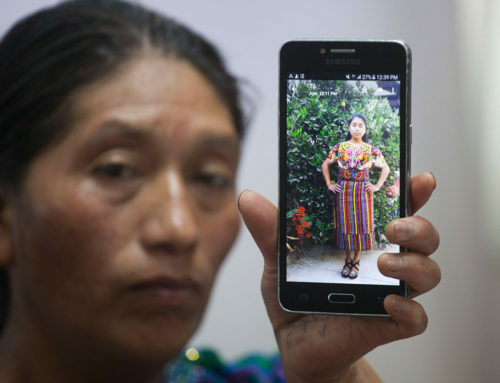 These are the kinds of conditions of abuse and threat that make human rights accompaniment a necessary and valued solidarity strategy in Guatemala, especially in Huehuetenango. As criminalization intensifies, the people I accompany have asked that we maintain our presence in the region and expand it into new spaces — to court rooms and prisons, and in activities where potentially criminalized activists risk arrest. More than anything, this has meant that my team and I have been present to observe the legal processes starting at the moment of incarceration, and that we’ve heightened our attention to factors of security that threaten the capacity of the people we accompany to live, work, and organize for their communities safely. In this context, it is clear that international accompaniment alone does not wield sufficient dissuasive power to prevent the unjust imprisonment of activists. Rather, as our presence continues to be felt and valued by the people who request it, we must think of ways in which accompaniment can support a variety of strategies for reducing harm while working to undermine exploitation and abuse. 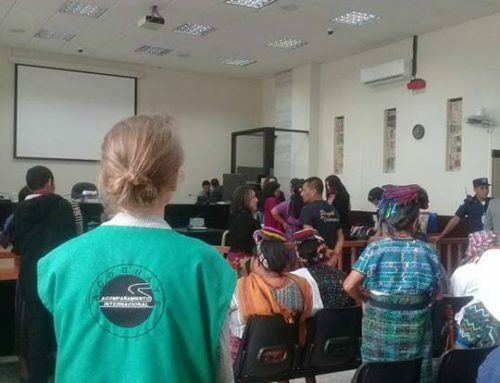 On my last day as an accompanier, I observed the first hearing for the case of three leaders from Barillas who were arrested almost exactly three months before. The outcome of the hearing wasn’t positive; the judge denied the defense’s request to revise the charges in consideration of various irregularities in the investigation, and it remained unclear how long they’d have to wait for their next hearing. But as we left the courtroom, things got worse: another community leader who’d traveled from Barillas in support of his three compañeros was presented with a photocopy of a warrant for his arrest. Nearly two hours passed before he was presented with a legal version of the warrant, and we accompanied him as he was handcuffed and taken to the basement holding cells to await his arraignment. As I observed his entrance into the jail, I heard my name being called from a nearby cell, “Don Davíd! Aquí! Don Davíd”! The three men who’d had the hearing earlier that day were waiting to be transferred back to their long-term cell assignment in a nearby prison. They called me over to ask me questions about the arrest of their compañero, to advocate for the safest placement possible for him in the prison where’d they’d been held previously in Huehuetenango, and reached their hands up out of the dark cell to touch mine through the narrow bars. They smiled as I said goodbye. While I reciprocated the joy of seeing them, the feeling was hard to sustain. I’ve never seen places so ugly and hopeless, so unapologetically violent, as the prisons where I’ve made visits in the last six months. It isn’t possible to witness the horror of mass incarceration without feeling some level of powerlessness and rage, without feeling exasperation with common sense notions of justice that rationalize such contempt for human life. I’ve been holding these feelings for several months now, perhaps longer, and I think those feelings are important, but I am so grateful for those smiling hands in the darkness reminding me that joy is necessary in survival. There are lots of ways that I will remember my work as an accompanier, and there are many ways in which I intend to continue in its spirit in other contexts. I’ll be transitioning back to my “normal” life in the next few weeks, but I feel more aware than ever that while working as a human rights accompanier has been a unique experience in my life, the ongoing work of shared survival is everyone’s. That work didn’t start six months ago and it doesn’t end now. As always, thanks for sticking with me throughout my experience.